第二次世界大戦後、折り鶴が特別なものになります。 Origami cranes took on a special significance after World War Ⅱ. 広島 平和記念公園の「原爆の子の像」では、少女が折り鶴を空に掲げています。 The Children's Peace Monument in the Hiroshima Peace Memorial Park depicts a girl lifting a paper crane towards the sky. 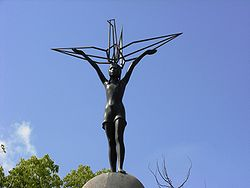 この像のモデルになった少女は2歳の時に被爆しました。 The girl who was the model for this statue was exposed to radiation in the bombing of Hiroshima when she was two years old. その9年後、彼女は白血病を発症します。 Nine years later, she developed leukaemia. ある日、「鶴を千羽折ると願いが叶う」という言い伝えを耳にした少女は、「元気になりたい」と願い、薬の包み紙などで鶴を折りました。 One day, lying in her hospital bed, she heard that folding 1,000 paper cranes would make her wish come true.Her wish was to get well, so she began folding paper cranes using medicine wrappers and whatever paper she could find. しかし その願いもむなしく、彼女は12歳でこの世を去りました。 But her wish did not come true, and she died at the age of 12. この少女の物語は広く知れ渡り、千羽鶴は願いや祈りを込める特別なものになったのです。 The story of this girl became widely known, and later, people began to consider sets of 1,000 cranes to be a special form of origami imbued with hopes and prayers.